While browsing through my posts from the past few weeks I noticed that I had been placing a pretty heavy emphasis on my work and work-related topics. While I am a self-diagnosed workaholic, I do find some time to unwind. 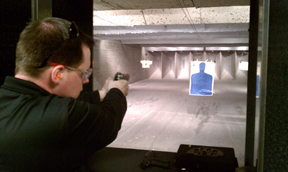 The Lovely Kimberly and I took some time on Friday to head out to the Bullet Hole for some time on the range. 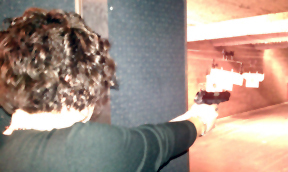 I was firing a 9mm Tanfoglio compact and the Lovely Kimberly was testing out her newly repaired 9mm Ruger. My grouping was pretty good at 25 feet. I was able to place 15 rounds center mass in less than 30 seconds. It had been a few months since we found time to shoot, so I was glad to see I wasn’t too rusty. At feet I placed 6 of 15 rounds center mass, with the other 9 rounds all hitting the silhouette – just not smack in the middle where I was aiming. That sounds like a lot of fun. I’d love to go to a firing range sometime and shoot some handguns. When I was a kid my dad used to take me target practicing with a .22, but I’ve never shot a handgun. Perhaps I’ll have to look into firing ranges in my area. that was pretty impressive dude..